Its all over the place at the moment- radios, newspapers, local trains, buses, everywhere. The 'Meter Jaam' to be followed on Thursday, the August 12, 2010 is the hottest topic in the city. Three young advertising professionals Abhilash Krishnan, Rachna Brar & Jaidev Rupani, launched a non cooperation movement against the autocracy of the auto-rickshaw and taxi wallas in the city. The recent hike in the minimum fare of the Auto-rickshaws and taxis is taking the common man for a ride in the literal sense. Not only are the meters adjusted to run fast, but also the auto and taxi wallas are reluctant to take small distance passengers. How far the initiative has its effect, only Thursday will tell. But the it definitely is a step forward to put forth the common man's agony against the 'what can i do alone' attitude. On the pretext of hike in the prices of CNG, Bombay Autorickshaw and Taximen's Unionhad called for a strike on June 22, 2010 to support their demand for hike in auto and taxi fares. 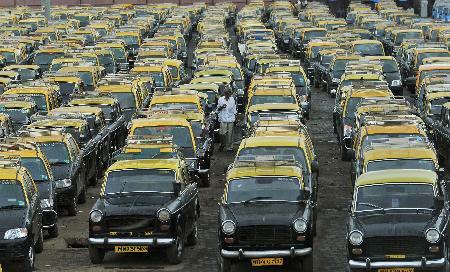 The strike succeeded with a hike in the auto and taxi fares in Mumbai and Thane with effect from June 24, 2010. The minimum fare has gone up y Rs.2 and Rs.1.50 for every subsequent kilometer. Meterjam was not sucessful because of many reasons. One of the major reason being lack of unity among us. Also the proportion of public transport to population is very negligible. One person cannot change the system but united we can surely make a difference.